It is Sunday afternoon and I am slowly coming down from the food high that I have been riding since Friday evening. I think I can safely say that the first Cincinnati Food and Wine Classic was a solid success with plenty of room to grow in the future. The event took place Friday evening and all day Saturday in Washington Park, with a few surrounding restaurants playing host to various after parties. I was lucky enough to attend both days with a VIP media badge and here are some of the highlights. The folks from MadTree Brewing brought to my attention an event they will be collaborating in with Fifty West and the nonprofit Starfire U. The event is being held at Fifty West’s taproom on June 5 and will benefit Starfire U. Tickets are already on sale and information on the event and Starfire can be found below. This looks like a great event from two of our newest local breweries and the ticket proceeds go to a fantastic cause. Get yourselves over there and drink some beer for charity! The Brew Review hosted by Michael Makin and friends is a premiere event in collaboration with MadTree Brewery and Fifty West Brewing Company. The event features a commemorative glass, dinner by the bite, and craft beer tastings including a new custom brew brought to you by Michael Makin and friends, MadTree Brewery and Fifty West Brewing Company to be debuted night of the event. Also available for purchase are custom growlers celebrating the event as well as basket raffles. 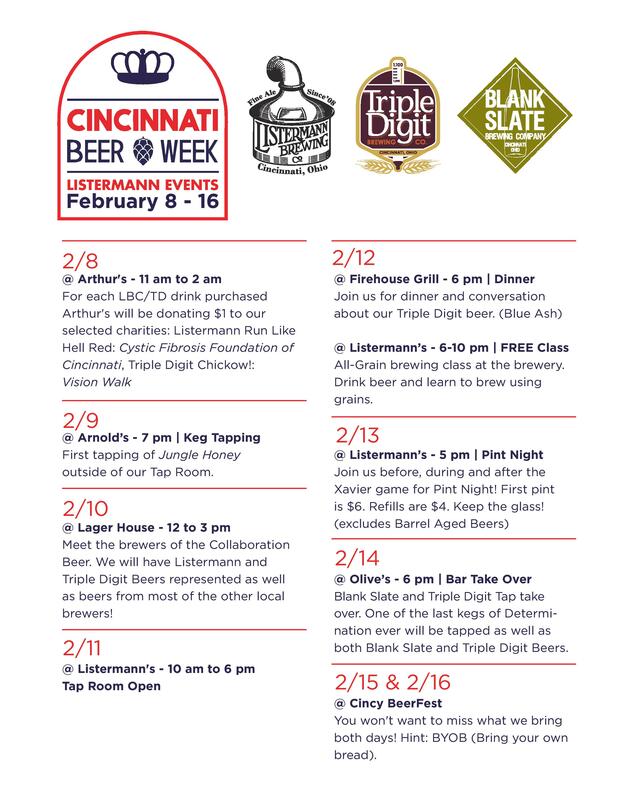 The good folks at Listermann/Triple Digit just passed the flyer for their Cincinnati Beer Week events. It looks like they’ll be up to no good (I kid, I kid) every day of the week, so make sure you get your butts to at least one of their events. I’m sure these will eventually be up on the Cincinnati Beer Week site (which now contains next to no information), but that day is apparently not yet here, so feast your eyes below. I was invited to what looks to be a delicious dinner at Final Cut Steakhouse, which is located in the Hollywood Casino (Lawrenceburg, IN). A couple of the QCD authors went to a beer dinner hosted at the same venue (which sadly, I couldn’t make, but Tom covered well) and the food looked delicious. Well, it looks like I’ll get to see for myself and will let you know how it goes! If you’re interested in joining me, see the details below. The folks over at Teller’s just recently released their beer list for their annual Hyde Park Craft Beer Symposia. For those of you not in the know, the Symposia is one of the most unique beer events in the Cincinnati-area. Breweries each bring two beers (mostly draft, though some bottle) to Teller’s for the event. It is very different from other beer festivals in that you sit at a table or at the bar and the beers are brought to you by the wait staff. It’s a cool way to be able to spend time drinking and discussing the beers with old and new friends, rather than waiting in line for a half hour to try a beer. There are also educational panels which consist of the brewery reps, brewers, and others in the industry. The restaurant is closed during this evening to anyone except ticket-holders, so it’s a quite inclusive thing. They don’t oversell tickets either, unlike some other area events, so it’s a nice, comfortable, casual evening. The price is $60, which includes pours of the 30+ beers they have available. Food is not included, so if you want something to snack on, you’ll be paying more than that. $60 definitely is not cheap for a beer event that doesn’t include food, but in my modest opinion, it is worth it. Last year they had a number of limited, draft-only beers that there is pretty much no chance you’d be trying anywhere else. Plus, sometimes you just have to treat yourself.